I played turns on this very nice map ( ) yesterday and this morning and, since I don't have any hopes to complete it before the deadline, I just happened to read the spoiler threads. I wonder why nobody seems to have settled the Great Spy ? The few extra beakers are perhaps negligeable but perhaps they aren't when the map is covered under forest. They certainly help sustain expansion, if only a bit. Say you settled the spy, by 1 AD you passively accumulated 1800 . Don't even need trading, you could steal anything. And vision. Seeing what everybody techs. Like : I'm totally getting Mathematics when Stalin does. Settled 1SE because food is mama. Oracled Monarchy 1600 BC, didn't grow as much as I anticipated, though. Clawed my way to Pottery 1200 BC. Traded for Alpha circa 800 BC (Monarchy + Poly). Going on 10 workers, should settle 2 more spots (south gems and German borders), should build swords and attempt capture of barb city. Stalin has Walls everywhere, which is annoying. Got early failgold from Stonehenge and recent gold from the Pyramids and ToA. The map is so nice I just might try to complete it, despite my best efforts to actually not complete games. I settled my spy @ Stalins place and got an insane ammount of EP for it. 4000+ and that was after I used it to scout a large chunk of the map. I then stole all small techs this way. The extra beakers you get from settling right away might prove valuable though, and also I paid 1GPT upkeep cost for the spy for a long time. Massive face palm lol. 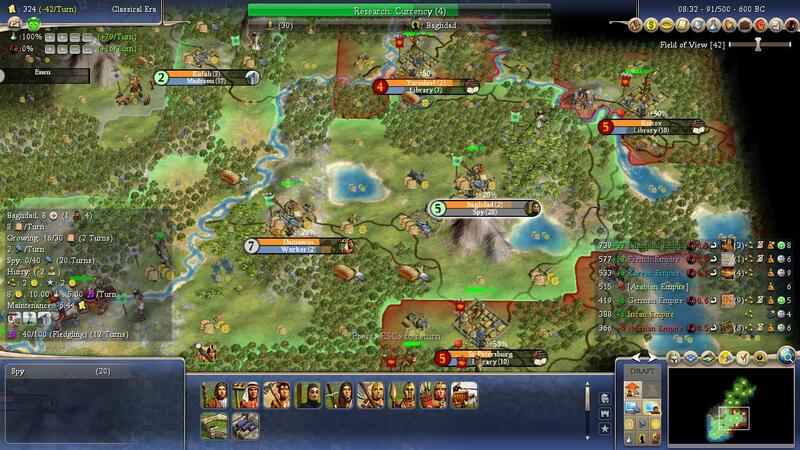 I SHOULDA, COULDA, had a 250 AD Conquest victory, however, I made two accidental clicks. The 1st was making the mistake of declaring on Inca 1 turn before Zara would have Capitulated. Basically, the way the capitulation mechanics work are that Zara wouldn't capitulate due to not wanting to be pulled into my war with Inca. The other misclick was accepting a demand from Korea which then put a much longer time frame for my last war. Anyways, I discarded the game in disgust and refused to finish, what most likely would have been a 550-600 AD Conquest. Just waaaay too many turns wasted from those above mistakes and I'm the kind of guy that refuses to post mediocre games! Rant over. I'm sorry, but this sounds bonkers. You could probably have won conquest with a 500 year margin even with the errors. If you decided to reload and play out the game that naturally meant you couldn't submit, but if not, I would suggest to simply play it out and submit. Unless some other big shot has an even more amazing game, you'd win an award at a canter here. This is the game where I had an accidental DOW at the worst possible time due to a bug, and although it frustrated me to no end and I was close to quitting the game, I still played it out and submitted. From what I recall the score ended up decent, so maybe I have an outside chance of some type of medal, and it was a cointoss that landed on conquest. Even with your mistakes, you would have beaten my game with 700 years or so. Thanks for the encouraging words Pangae , however, I wasn't concerned about beating/losing to any other submissions. My main focus was playing against myself and performing to my own pre-described standards. I'm also the kind of guy that will not submit anything that fails to meet that criteria, regardless of I was winning, or would have won. I'll try again in future GOTMs, and if I play a quality game I'll be more than happy to submit. All GOTM games and not only yours have mistakes or bad luck in them due to no reloading. True, you messed up, but you also got very late Oracle (in my game you'd lose it) and Mids and did not sacrifice expansion for them as you should if you really relied on them. Late Oracle is a bad play even if you get lucky when you have strong civs starting with mysticism and IND trait. You weren't messed up in early fights by RNG, your warrior was at the right place to steal multiple workers and so on. I mean, if you expect every coin flip to go into your favor, why even bother with no reload/one try setting. Also, multiple targets would not delay you that much at all. Maybe first targets yes, but the last target, maybe not at all with your tech advantage due to crazy luck before. Basically, I do not get this if my game had been perfect, I would have had a perfect game ranting tautology. BTW, I lost late Oracle in 1400BC (overly greedy play from my side) and that also cost me Bureaucracy powered chops for Mids. Stole only one worker in spite of patient warriors waiting for first ring food to get improved. But I had some crazy luck in fights later on. AP forced peace with Frederick the turn after I have taken Berlin and then he peacevassaled the following turn at cautious. 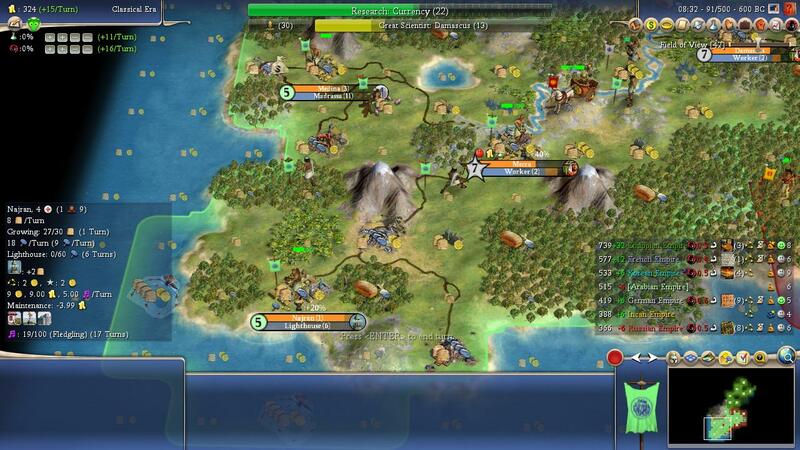 Everything I know about Civ was learned through reloading. Shoo, you fascist no-reloading puritans. Shoo! @shakabrade , I'm a perfectionist, and playing close to that level is what drives me and keeps me coming back. That's where all the fun is at for me, and of course, when I fail (which often happens), it pushes me to strive for better results in the future. My philosophy of game play and what gives me enjoyment is vastly different than yours, as it is with all of us. Also, here are average Immortal Wonderdates and times that you seem unaware of: https://forums.civfanatics.com/threads/immortal-wonderdates.611664/ . Even if I missed out on the Oracle I'd still be able so self research Bureaucracy 4t after my HBR date (I'd have a combined max research of 115-121 ), which means I'd only be slightly delayed and have extremely strong mid game potential. And while RNG on Chariots was indeed in my favor, worker stealing was also facilitated by having espionage points on targets which let me see their city data, not to mention, how many, and what direction workers were going. That was all part of a well thought out game plan. And like I already said in my previous post, it has ABSOLUTELY NOTHING to do with posting a winning date or the worst date possible, but rather, it's all about playing within a reasonable expectation of my skill set. If I thought I had executed in near approximation of my abilities I'd be more than happy to post a horrifically late victory, even if it was by far and away the worst game submitted. Anyways, I have no idea why my decision to play the game on my terms is putting you off. @cseanny, I can understand that you are a perfectionist mainly through how non perfectionist I am, if that makes any sense . Maybe you are a scientist dude and I am an engineer guy. Your non-perfect game would still be stellar. I think it is a waste to, well, waste it. Regarding Bureaucracy, it'd have delayed your Mids, if you'd gotten them, Guilds for sure. You'd also have smaller force with more chops in Mids and less in units. It'd still be a good game as you somehow managed not kill the economy as I understand. Worker steals, I had a Great Spy for vision. Workers simply went improving too far away. Luck. Thanks for those wonder dates, saved! Until last GOTMs, I've played Deity only and developed very conservative relationship towards wonders (actually a bad habit for lower difficulties). But with extra AIs, strong civs and Ind guys, cooked map for surprises, I'd move at least one standard deviation from the normal game median to have 50% chance. Or one and a half to have a good chance for critical wonders. I actually rolled an Arboria map with our settings and had patience to push end turn until ADs to see the dates (and to see what kind of the map Arboria is), three times. But then I only use the earliest date for the reference. Did that for the Prince GOTM game earlier as well. If you are posting, a reasonable guess is that you are also participating. If you don't want to submit that is of course your option, though I find the reason pretty odd. I'm sure you'd get some kind of laurel if you did - whether you care about that or not. But maybe you reloaded the game at some point, for instance after that DOW? Otherwise I guess you couldn't really know he would have capped the turn after - at least one couldn't be sure. The 1st was making the mistake of declaring on Inca 1 turn before Zara would have Capitulated. I can sympathise about suffering from or desiring perfection. I do myself, though I try to improve (harr harr). As they saying goes, perfection is the enemy of the good. hmmm..read the bit above on DS's response to Pangaea about the last turn of the game. I'd too always assumed that no moves were to be made on the very last turn. The "one more turn" just simply a must in order to make the final save. edit: oooh...sorry to hear about cs's game. I figured from his early write-up that he was going to blow this one away. Too bad it was not finished. @Pangaea There was no reloading. I initially captured the 2 largest Zara cities, and in 1 more turn I would have captured his 3rd largest city. This would have brought my war success to over 70, and paired with Zara's 4/10 Capitulation, in conjunction with the next turn, he would be below the 2/3* (total combination of world power ratio) and capitulate. So I just figured I might as well start my next war as soon as possible!! The kicker? As I said in first post, I got the (paraphrasing because I forget exact verbiage) "we don't want to be involved in your war" capitulation declination. Likewise, Inca, who also has a low Capitulation threshold, and whom didn't have many cities and therefore would also fall below the 2/3*(total combination of world power) would capitulate very easily. WOULD HAVE!!! He also didn't want to be brought into a war. This means I had to get a cease fire with one of them, upon which the other would immediately capitulate, but then I had to re-declare and start my war success all over again. Granted this wasn't the end of the world but irritating. The infuriating mistake was an honest misclick of accepting a demand from WangKon, which then put my last war on a 10t back burner! Degaulle capitulated in like 3 turns after my declaration in which I only seized on of his cities but still had over 40 war success (I had gifted him 2 cities prior and then captured them, plus he sits at 0/10 capitulation). I had planned to also gift Wang Kong 3 cities before declaring on him (if he would take 3), and likewise, getting what most likely would be a 2-3t capitulation as well. That would have been a 250 AD win if I executed everything perfect, with a score which would probably range in the 385-400K range. @cseanny I understand getting bummed out when you have the feeling you ruined the perfect finish to an excellent game. @pomthom I haven't played SGOTM before. And playfully, but serious, I wish people would stop saying late Oracle lol!! The average Immortal Oracle date is 1080 BC while the average Immortal MIDS date is 675 BC!! https://forums.civfanatics.com/threads/immortal-wonderdates.611664/ If I missed the Oracle fail gold plus Mids powers through CS fast enough ^^. I might try and play the Monty game. Need to get my game face on. @pomthom I haven't played SGOTM before. And playfully, but serious, I wish people would stop saying late Oracle lol!! The average Immortal Oracle date is 1080 BC while the average Immortal MIDS date is 675 BC!! https://forums.civfanatics.com/threads/immortal-wonderdates.611664/ If I missed the Oracle fail gold plus Mids powers through CS fast enough ^^. I agree. I remember how HoF players were regarded as second rate civvers back in 2011, but WastinTime, kaitzilla and now cseanny, really show fantastic outside of the box efforts and win in SGOTM and GOTM. I always strived for consistency on deity but am actually jelaous when I see crazy conquest and space dates. I really am. So much knowledge, skill, planning and effort.